The rise of the so-called “gig economy” in the US has exploded in the last few years – last year, the Bureau of Labor & Statistics reported that 55 million people in the US are “gig workers” which represents about 35 percent of the US workforce — and it is supposed to rise to an estimated 43 percent by 2020. So, what is different about this new economy besides its new nickname? It’s how these workers are being paid, and more specifically, how the income being paid to many of them is not being reported to the IRS and state tax agencies. In a typical worker-employer relationship, a US individual receives a form W-2 in January annually from his or her employer, which reports, among other things, the total amount of income paid to the employee during the previous calendar year. Prior to the adoption of mainstream payment processors (think PayPal), independent contractors generally would receive a form 1099-MISC when they performed a “gig” for a US company that paid them at least $600 during the calendar year. The typical accounts payable process involved payments being made to these individuals via check, wire or ACH and at year-end, with reporting of the 1099 to the independent contractor and to the IRS. As non-traditional payment methods emerged, companies began abandoning that typical accounts payable process. First, there was a shift to using company procurement cards (a.k.a. P-cards) and corporate credit cards because these methods offered payers a new and less expensive process for a significant number of their accounts payable payments. Around the same time, Paypal and eBay emerged – and with that, new electronic methods of paying independent contractors. 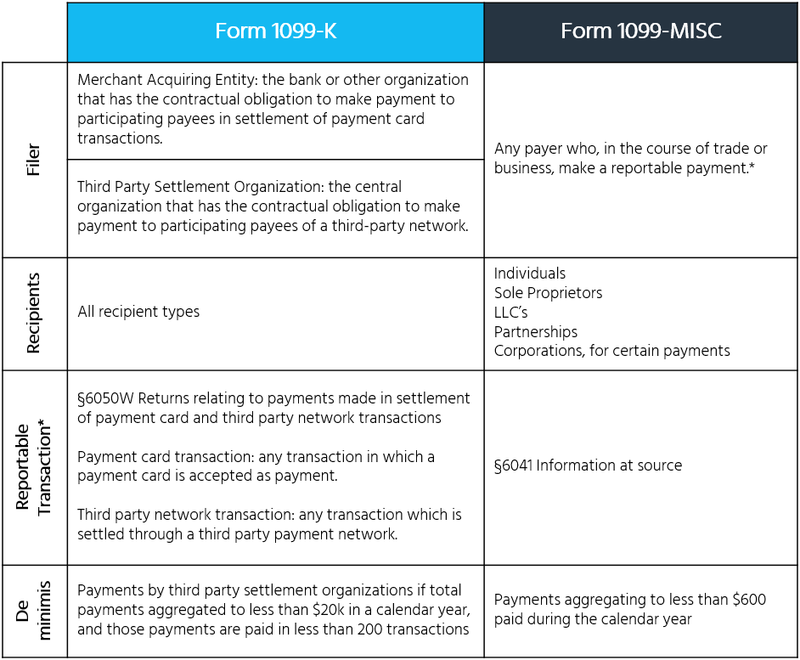 These new processes didn’t really align with traditional form 1099-MISC reporting processes and in the Housing and Economic Recovery Act of 2008, the Treasury added requirements for a newform 1099-K Merchant Card and Third-Party Network Payments. Lawmakers supposedly devised the 1099-K reporting process to capture income from those individuals and sole proprietors that were earning income through the platforms that existed in 2008 (i.e. eBay). For this new 1099-K form, a reportable transaction included any payments made via a payment card (e.g., credit card, gift card, P-card, etc.) that were accepted by a business owner and settled through a third-party payment network, such as PayPal. The final regulations under internal revenue code§6050W also provided that if a payment qualified for both form 1099-K and form 1099-MISC reporting, a filer should report the payment on (and apply the reporting rules for) form 1099-K.
Aside from the payment method, the notable reportable requirement differences between these forms lies in the de minimis rules. For third party settlement organizations, a form 1099-K is not required to be reported to the taxpayer and to the IRS unless the recipient received income totaling more than 200 transactions and when those payments equaled at least $20k during the calendar year. By comparison, a form 1099-MISC is required to be issued, for the same income and to the same recipients, when total payments aggregates to at least $600 in the calendar year. Why the $19,399 disparity and reportable transaction limits? Only the Congress and Treasury can answer that. The tax gap is the difference between taxes owed and taxes paid. In 2016, the IRS estimated that the gap was around $400 billion. In that same report, the IRS concluded that about $387 billion, or 85 percent, of that total gap is made up of underreporting of income. Of that 85 percent, almost 60 percent is a result of underreporting of self-employment income. In previous reports, the IRS has also indicated that when income is subjected both to tax withholding and information reporting, taxpayers only fail to report about 1 percent of their total taxable income. However, when a taxpayer receives income that is not reported to the IRS, studies indicate that 99 percent of the time that income goes unreported. Again, both the 1099-MISC and 1099-K forms are generally geared towards reporting income that was paid to independent contractors as a result of services performed, so it is confusing as to why Congress and the Treasury created a gaping chasm in the reporting requirements that is leaking billions in tax revenue every year. In 2017, the Senate put forth the New Economy Works to Guarantee Independence and Growth (NEW GIG) Act of 2017, which would have aligned the 1099-MISC and 1099-K thresholds to $1000 and would have eliminated the 200-transaction threshold for the 1099-K. The House put forward the Small Business Owners’ Tax Simplification Act of 2017, which proposed a $1,500 threshold and removed the 200-transaction requirement. Neither bill moved forward. The US economy isn’t the only one losing tax revenue as a result of this division in the reporting requirements; states are losing millions too, and not just in underreported income. When self-employed individuals do not report their income, income taxes aren’t the only thing that goes unpaid. Generally, states have found that these taxpayers also forego paying their self-employment taxes (e.g., FICA), sales and use taxes, lodging taxes (think Airbnb), and so forth. Vermont was the first to correct this in 2017 when it passed a bill to eliminate the 200-transaction threshold and to reduce the reporting threshold to $600 for filers reporting form 1099-K to recipients in that state. The state estimated it would bring an additional $1.5M in tax revenue as a result of the change. A nearly identical proposal passed in Massachusetts the same year – and it was estimated to bring in an additional $20M in tax revenue to that state. Since then, other states have joined the fray. New Jersey and Arkansas both require the form to be reported at significantly lower thresholds than IRS and with no transaction limits – $1k and $2,500 respectively. Last year, Pennsylvania introduced a bill to reduce the reportable 1099-K threshold to $5k and to eliminate the transactions limit altogether. At the eleventh hour, Washington, DC, added the 1099-K to its list of reportable forms at the $600 threshold in mid-December. And California and Illinois are actively considering similar legislation. Some states have yet to even adopt the form as reportable in their state, but that is rapidly changing also. In 2018 alone, Iowa, Connecticut, Alabama and North Carolina all added specific reporting requirements for the 1099-K, albeit at the federal threshold. Rather than pursue a threshold change for some payers, California has also been tackling worker misclassification issues by creating even stricter classification rules than the IRS. In May 2018, the California Supreme Court rendered a decision in favor of the state inDynamex Operations West, Inc. v. Superior Court of Los Angelesciting that the drivers could not be treated as independent contractors because the company’s primary business was to provide same-day courier and delivery services. This change required the employer to begin administering payroll tax deductions and reporting on form W-2 rather than form 1099-K.
Each state has its own set of rules in terms of what tax information it requires and how the information is to be submitted. Historically, the adoption of tax information reporting requirements at the state level that do not align with IRS is not entirely uncommon. For example, many states require form 1099-MISC to be reported but only when state tax withholding is applied to the payment(s). However, what is not so common is for the threshold for reporting to be lower than the IRS requirement. And this disparity poses a complexity for some filers when it comes to producing the data needed for state reporting. From a process standpoint, many business systems have some basic functionality that helps companies to produce data at year-end that can be used for IRS tax information reporting purposes. But generally, those systems do not also produce the data needed for state reporting. This requires filers to prepare the state-level reporting data by using the data that was produced for IRS reporting purposes. That data now reportable to the states is not reportable to the IRS due to form threshold differences. Therefore, filers will need to find a way to identify the reportable data and create outputs that meet the state specifications and formatting requirements for just these forms 1099-K. This nuance creates yet another “special” process for a January season that is already packed with new accelerated filing deadlines as well as the harried printing and mailing activities due by January 31 — a process that has already proven to be a significant undertaking for many filers. With an estimated 43 percent of the workforce expected to be made up of gig economy workers by 2020, the number of reportable accounts in just the states previously mentioned is going to increase. Additionally, given the legislation that has emerged these past few years, additional states will likely continue to adopt lower threshold reporting requirements for form 1099-K in order to prevent gaps in state taxes paid by their residents. US payers should consider investment in automated tax information reporting solutions that can produce electronic files formatted not only for IRS reporting purposes but also for state reporting purposes and particularly at specific state threshold levels. Find out how Sovos has been keeping companies compliant with state and IRS reporting regulations for decades. Wendy Walker is the principal of Tax Information Reporting solutions at Sovos. 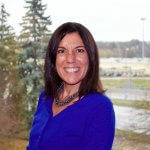 She has more than 15 years of tax operations management and tax compliance experience with emphasis in large financial institutions, having held positions with CTI Technologies (a division of IHS Markit), Zions Bancorporation and JP Morgan Chase. Wendy has served as a member of several prominent industry advisory boards. She graduated with a BS in Process Engineering from Franklin University and earned her MBA from Ohio Dominican University, in Columbus, Ohio.